It started with gathering, registration and welcoming dinner on Wednesday evening, December 24th and lasted until Sunday, Dec. 28th. Priests from the Deanery and Father Ljubisa’s wife, popadija Natasa taught kids, separated in four age groups. Every day started with either Matins, or Divine Liturgy, followed by breakfast, classes and some activities. After Vespers and dinner there were different fun activities for the participants. On Thursday we visited Tanglewood park for the festival of lights, on Friday, Ice-skating and bowling and on Saturday snow-tubing on the mountain. Early Friday afternoon we visited the Panagia Prousiotissa Greek Orthodox Monastery in Troy, NC. The whole group enjoyed time in the monastery, where sisters first had Paraklesis service and then mother Agne explained the history of the monastery that was established by Elder Ephraim of Arizona in 1998. Following the visit to the Monastery Bookstore we had lunch in the Monastery dining room and, before leaving, the whole group, under direction of popadija Natasa from Orlando, sang a Christmas song “Bozic, Bozic, blagi dan” for the sisters. Soon after our arrival back at our Church, His Grace, Bishop Mitrofan joined us for a day. His Grace had a conversation with the campers about Stewardship in general and what each one of us can do for others in return for all the blessings, God bestowed upon us. The focus of the discussion was on the Divine Liturgy and the preparation for the uniting with the Lord in the Holy Communion. After dinner, the campers went in two groups, one that chose Ice-skating and the other who went bowling in Greensboro. Saturday started with the early Hierarchical Divine Liturgy which was officiated by our Bishop Mitrophan. Protopresbyter Fr Dragan Zaric from Clearwater, Fr. Ljubisa Brnjos from Orlando, Fr. Miladin Blagojevic from Atlanta, Fr. Stanislav Kravljaca from Jacksonville, Deacon Gavrilo Miljkovic and the host Priest, Fr. Dragoslav Kosic also served. After the Liturgy and breakfast His Grace once again addressed the campers and thanked Parishioners of St. Basil for organization and especially sisters for beautiful meals. Due to His busy schedule, His Grace left early afternoon and campers went snow-tubing in the mountains. They returned just in time for dinner and after dinner all the participants had a dancing class with our professional instructors Darinka Divljak and Ranko Bogosavac. These very talented and accomplished dancing instructors made the really nice last touch on our camp activities. Some of the guests from other Parishes had to leave on Saturday and some stayed until Sunday. We are very grateful to all of them for making an effort and driving long hours to join us for camp. 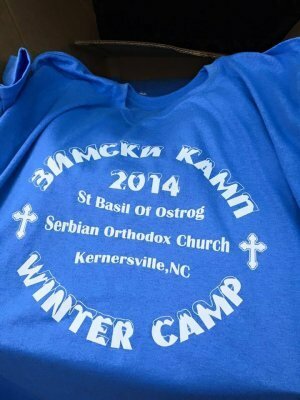 I would like to commend the Parishioners of St. Basil’s, especially the Circle of the Serbian Sisters led by Kolo President, Sretanka Stankovic, for making sure that all our brothers and sisters from visiting Parishes feel at home and for preparing all the meals during camp. Given that our Parish Hall is still under construction without kitchen or any appliances, it was not an easy task but, thanks God and St. Basil for the beautiful weather they did really well. I would also like to thank all those who in any way helped that our camp experience be memorable one: His Grace for finding time to join us at least for a day, all the visiting Clergy, sisters, all the men that worked long hours and our teenagers who showed that they understood what the stewardship is all about. We pray to God that all those who do not find it necessary to give their children the opportunity to participate in these camps, or Church School classes, understand that the time and resources that we spend in these and similar activities under direction of our Holy Church might be our best investment in the future, for the benefit and well-being of our children and of our communities.